Hey, have you heard of Scott Kelby and his World Wide photo walk? This year, the fourth year that he has held the photo walk, he had over 27,000 participants in over 1,100 cities throughout the world. I went along to the Oxford, UK walk organised by Glyn Dewis and one of the shots I took on the day was selected as the regional winning photograph. 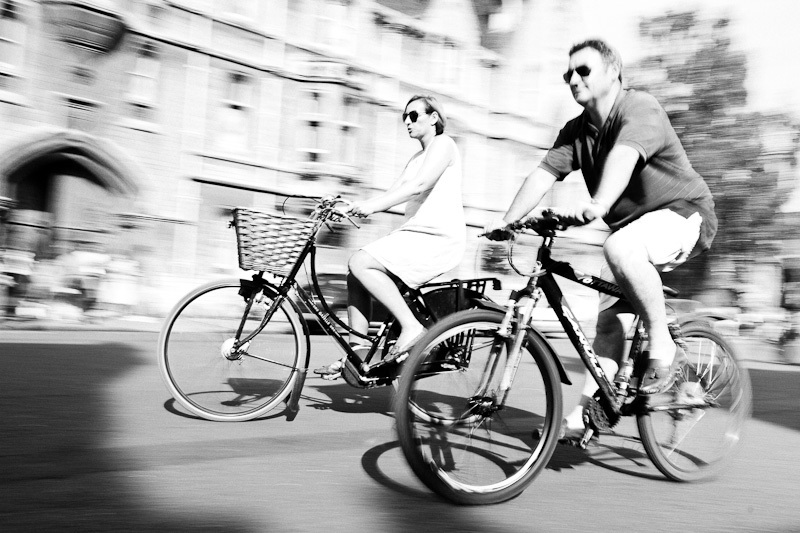 Glyn had set the task of “Best Bike Shot” for the Oxford, UK competition entry. I was actually quite disappointed when Glyn announced this. I studied photography in Oxford and my lecturer had two rules for all photography assignments, no graveyards and no bike shots. I honestly don’t think that much else stuck with me from this course, but the no bike shots rule did. It’s just too clichéd when you live in Oxford. What I did think I could do was turn it into a “Best Bike Shop” photo and see if this would impress Glyn. 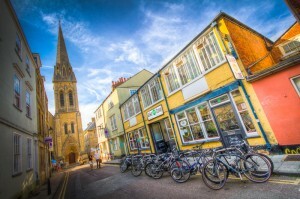 Oxford has a lot of bikes and a lot of bike shops, but, there’s a brand new shop just opened in the centre of town and it’s a big hit with the cyclists. The shop has taken up the space of the old bookbinder’s workshop that has sat empty in St. Michael Street for years. It’s also looked like a great building and The Bike Zone have made a great job of it. I wandered up to the Cafe upstairs and it was packed full of yellow jerseyed, Lycra clad people with calves of steel sipping on cappuccinos before continuing their Saturday cycling. It’s perhaps fortunate I couldn’t get a seat. I wandered back out into the street and immediately thought of the coffee craving Lycra clad cyclists dashing on their way, which made think of the slower shutter shot I could take. A motion blur panning shot of all the cyclists that dart about Oxford. I took a couple of test shots of the first cyclists that passed and then headed for sunnier spot with a better background. I made my way to Broad Street which is almost pedestrianised and would allow me to sit pretty much in the middle of the road. It is, as its name suggest very broad and was guaranteed to have a lot of sun one side or the other, and, I would probably be able to get some part of Balliol College in the background. I sat myself in the road outside Castell & Sons, the Varsity Shop, which is just at the end of the public road and were the pedestrianised part of Broad Street begins, and made sure I was as close as possible to the people that cycled by. My motor drive would get 3 or 4 shots as they passed through a particularly sunny part of the road. My shots were taken at f16, 1/20 sec, ISO 100. I was using a 10-22mm EF-S lens and zooming a little depending on how far away the cyclists kept from me while I was practically lying in the road to get a low angle for the shot. It was fun. More fun than I had first thought a “Best Bike Shot” task would be. And, a week or so later, the walk organiser choose my photo as the day’s winner. You can see his blog post announcing his selection on his blog here. This means my photo goes through as the regional winner as an entry in the main competition. FYI, you can see some of the many other shots I took trying to work out the right angle, the right position in the frame and right focal length for this shot.